Obviously, the main pairing of the story MUST be Jack/Will. 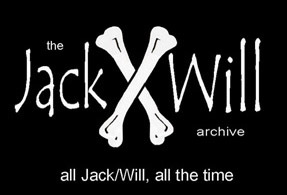 Other pairings are acceptable in mention but Jack/Will should be the focus. Het content is only acceptable in the context of a story that is primarily slash. JxW is currently not accepting Real Person Slash. JxW is currently not accepting stories with threesomes or moresomes. Please do not submit drabbles. Stories should be a minimum of 500 words. Please use *asterisks* rather than italics for emphasis. Consider using a beta reader.